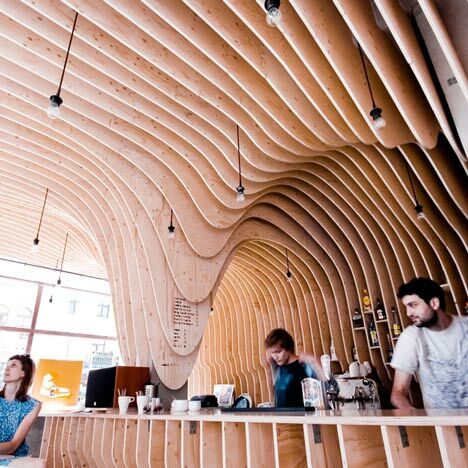 The timber stalactites of an undulating cave-like ceiling bear down around the bar of a coffee shop in Łódź, Poland. Light bulbs dangle from between the curved plywood ribs of the Zmianatematu cafe, which was designed by Polish architects xm3. Shelves are slotted between ridges in the wall, behind a bar that is also made from the ribbed timber. Patches of plaster are visible on walls, which are intentionally left unfinished. See our archive feature on unfinished interiors here. Planes of glass atop wavy plywood grids provide coffee tables. Other interiors on Dezeen featuring slatted timber ceilings include a restaurant with a fanning tree-like canopy and a ski resort cafe with timber lattice partitions. Photography is by Paulina Sasinowska. The city of Łódź located in the centre of Poland is one of three biggest cities in the country. Before the II World War a highly prospering city with lots of industries, now is troubled with poverty and social problems. Although it has high aspirations to be a cultural oriented city of artist and students. Aiming to be a design, fashion and film capital of the country, it acquires the concern from many great architects and artists who are willing to create concept designs for a delayed rebirth of the city i.e. : Daniel Libeskind, Frank Ghery, David Lynch to name a few. The restaurant is located in the very centre of Łódź - on the most important street in the city - Piotrkowska. The street - once a symbol of wealth of the one of the richest cities in this region of Europe is now an axis of mostly poor and degenerated district with monumental architecture from before the II World War. With a very small budget we created an outstanding space to host the artistic and culture parties for the creative youth of the city. The owners of the restaurant want to propose a space for happenings, art-exhibitions, and various art-oriented venues. As young architects from the Capital City Warsaw with the local Łódź art-oriented youth investors we tried to aim at city's condition and aspirations and create a reminiscent of the cutting-edge environment which has a connection with the city identity. The city's name translates literally as "a Boat". Inspired by a Boston BanQ restaurant we tried to create a blobish form similar to the boat roof form which eats in the old monument-building's space. The building itself dates to the end of XIX century. The elevation is a typical Neo-classical style. During the years the ground floor has changed function several times. Now being empty and unfinished the inside offered us the space to take and adjust. We decided to leave it as raw as it was possible. The proposal was to make the floor from the epoxy mass, leave the walls in raw roughcast and take the electrical installation out and leave it on the walls covered in steel, black tubes. The only element added is this alien form, a "hub" that creeps to the volume from the inside of the building, which then creates the bar and divides the space in to several functional areas. We can also see another division. This what is new and touches with the recently renovated external elevation of the building (the outside classical world) is new and white. The internal: dividing and construction walls as well as ceiling are in raw roughcast. The "hub" itself is cnc cut plywood. It is designed by sectioning the form, generated by adjusting to the space and to all installations hidden by it. The sectioning and preparing for fabrication was done in Rhino/Grasshopper software. During the prototyping phase we decided to do some additional furniture for the restaurant as the mock-up for the real structure. The furniture designed for the interior are the coffee tables, made of sectioned grid plywood and the bench which morphs from the bar counter.